It is downunder where blue and red have been interchangeable for YEARS! But before you start thinking us Aussies are a nation of colour-blind fools, it’s all due to the colloquial contrariness that means we call things the opposite to what they are. So a tall person becomes ‘Shorty’. A skinny person becomes ‘Fatso’. And a REDhead becomes ‘Blue’! Just to prove I CAN tell the difference, come with me to 10 of my favourite Aussie HOT Spots – the FIVE Coolest BLUE and 5 Hottest RED spots downunder! So where do you start looking for the COOLest Cool Blue places on the largest island on earth with the longest coastline of any country in the world? Right HERE! Use my handy round-OZ Aussie Hot Spot location guide – complete with 5 star BLUE factor ratings – to uncover five of the coolest, BLUEST experiences in OZ! 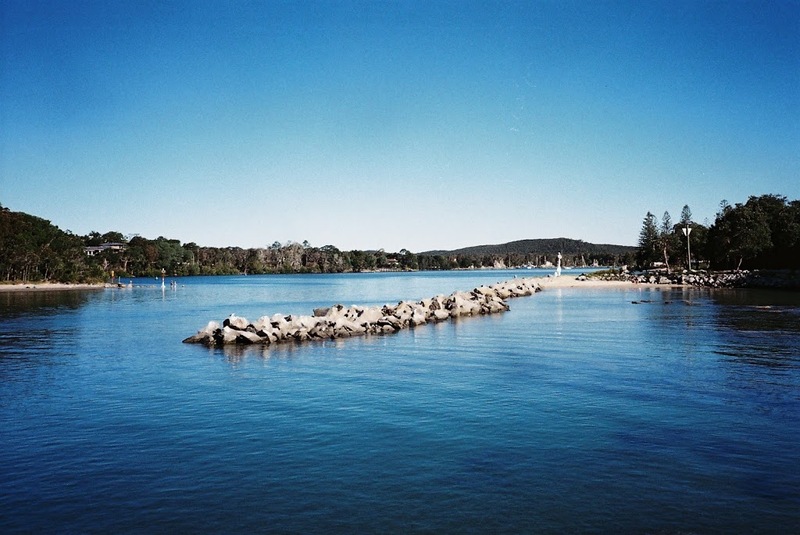 The Evans River in the New South Wales Northern Rivers district isn’t Australia’s longest, deepest or fastest flowing. But on this day it was surely in the running to be its bluest! Not quite blue enough for you? Head high above the breakwall to the Razorback Lookout for more, with the sea, the sky and distant mountains all contributing to this rhapsody in blue! Get a blue fix while you take a break from the crowds at more well known tourist hot spots Ballina and Byron Bay, just up the coast. And while you can’t see the excellent bakery or Scenic Public Toilet while you’re gazing out to sea, you CAN use all that BLUE to the max by fishing, swimming, boating – and whale-watching! If that sounds like too much effort, just sit back, relax and enjoy some COOL Blue time out! The BLUE waters of the Bitter Springs thermal pools near Mataranka in the Northern Territory aren’t cool at all. Loaded with minerals that give new meaning to ‘sculpted hairdo’ as they rise from the depths of the earth, the water is HOT. But although the daytime temperature regularly tops 30+ in the Top End, nights can be coolish during the Aussie winter. Cool enough for steam to rise from the stream connecting the three main pools – deserted at this time of day – and cool enough for us to dive right in and drift downstream from pool to pool before the morning rush. I tried not to think about travellers who used the pools for washing themselves and their clothes in lieu of paying caravan park fees … but luckily at this time of day I’m guessing they were all still curled up in their combi vans!! The deep relaxation as the warm mineral waters soothed away our aches and pains (relaxing IS hard work!) kept us doing the three-pool-drift circuit for hours. HOT BLUE? Too COOL! 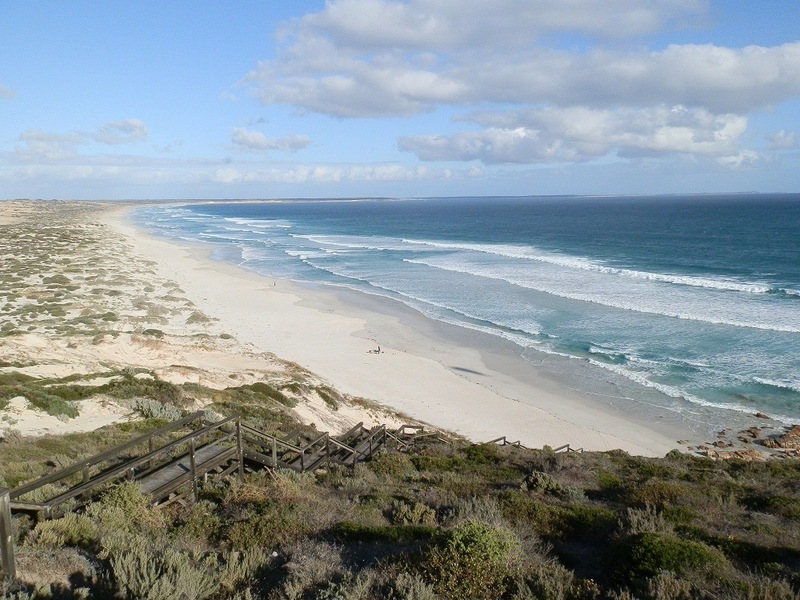 This autumn day down the other end of the country at the southern extremity of South Australia’s Southern Yorke Peninsula had created a symphony of stunning scenery – blue haze, blue sea; row after row of blue swirling breakers, blue, blue sky. But how much more COOL to see that marvellous blue expanse from above? Away from the blue drawcard of Australia’s coastline, the mighty Grampians rise above the bakery-dotted landscape of country Victoria, their astonishing BLUE silhouette visible for miles. And here in this mountainous region, cool means COOL! Signs at the base of the Mt William climb warn that snow may fall at any time of year on its 1167 metre summit!! As Pilchard and his family found out one long-ago fairly recent childhood December (the height of the Southern Hemisphere summer) when they built their first and only snowman. Like most Aussie mountain ranges, the sun warms and shines through the evaporating oil from the gum trees, causing a blue haze over the peaks, lakes and other geographic formations my wasted years at school mean I’m unable to name. Nameless or not, however, the haze contributes to the staggering BLUE views from the many lookouts dotted throughout the ranges. 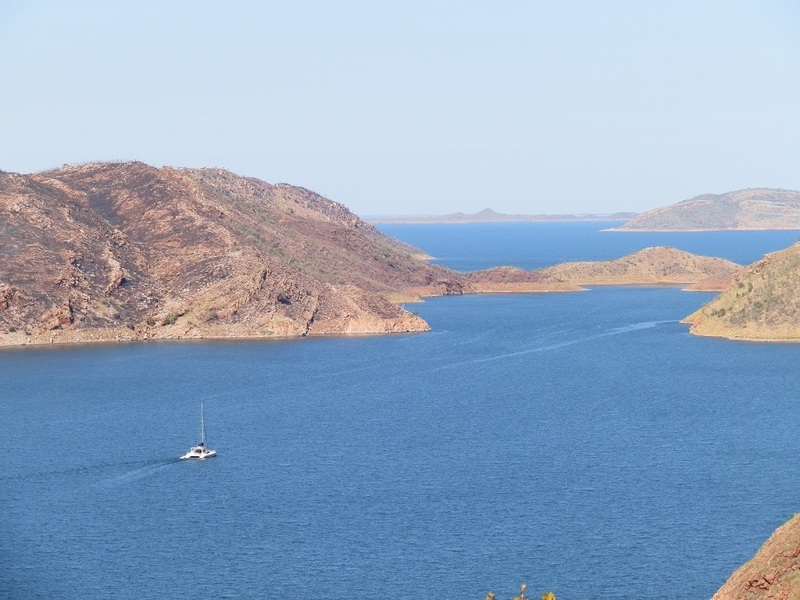 A drowned Kimberley mountain range, home of the pioneering Duracks, one of Australia’s most impressive engineering feats and the biggest, bluest lake it’s been my pleasure to view all contribute to the cool BLUE appeal of magical Lake Argyle! A cruise in the early morning calm of this gob-smackingly, mind-bogglingly enormous 10,763 gigalitre lake covering 1000 km² and 21 times bigger than Sydney Harbour is so full of outstanding landscapes I almost forgot to take photos. ALMOST! If this is the Western Australian wilderness, then bring it on! The presence of permanent water after the Ord River Dam was completed in 1972 turned the once-arid land downstream into an agricultural oasis. But the dam itself remains a haven for the birds and wildlife that inhabit the islands – now all that’s left of the mountain range beneath its waters. So what better vision to take us from COOL BLUE into RED HOT?? You’ll have to go into the RED zone over at Annabel Candy’ travel blog Get In the Hot Spot if you want to see my five favourite RED HOT Aussie Outback Places! Then let me know: IS blue REALLY the new red??!! « 1000 Words About … Duckweed! My FavouRED OZ Things #2! Amazing places, I so would like to go to Australia! Great post! Australia is such a vast land, full of gorgeous contrasts. I keep hearing and seeing great things from the Western Coast. I would need a lifetime to discover all its secrets! in that first photo… That first shot… Left me speechless! Gorgeous! We made it around the water in OZ but we didn’t get to the center or see any of the mountain areas. Beautiful shots! Red I LOVE your photos! I wanna come back! lol It’s bloody cold here now, I shoveled the snow off the sidewalks at about 1pm, there was so much snow that this job which normally takes me about half an hour, took me double the amount of time and it continued to snow so now tomorrow I’ll be back out shoveling again. I want red and blue in my life again, not white, grey and cold! Have a wonderful weekend! Cheers. I’d say it is! Great shots here, the colors are so rich and vibrant. My husband was a blue (he has faded with age) so I love Blues – I mean reds. Love the Broome Red. I enjoyed the blues — all the kind of places we love most. And the hot pools have me drooling in envy. But that red tide beach is my favorite — you have indoctrinated me well to expecting reds here. @budget jan – Hahaha! I was just waiting for someone to make the connection between Red/Blue and the blue rinse set! Some great shots!! Did you take that stairway down to the beach? How long did it take you to get back to the top? That is LONG set of steps!! @EG Camera Girl – And seeing them together was an extra thrill! @Judy – The steps look worse than they are, which is just as well … naturally, coming back up was WAY harder than doing down! @Debbie – Haha! Nothing like the shock factor!!! I was not ready for that red shot! The blue is always beautiful and peaceful but I loved the red tide. Incredible shots Red. Enjoy your travels. And it was worth waiting : those pictures are fabulous ! Thanks for this inspiring sharing. Your country seems really a wonderful location to visit. I love this theme. I hope to see your beautiful country someday. Love the pics. What a huge contrast between the blue and RED! Your cool blue sites are just as beautiful (and interesting) as your usual red sites. @jenny – Haha, that was my favourite bit!! @TMWH – Well, why not make your mini-vac longer and check out the RED too?! @Alessandra – No crocs! The water’s so warm and pleasant I don’t think I’d care if there WERE crocs! @Rohrerbot – Thank you! Come down anytime … or drop in – there’s always a new pic or two on offer! @’Tsuki – Thank you so much for dropping by! Glad you enjoyed it – and hope to see you again! There’s always WAY more of OZ to show!!! @Johanna – There’s a whole rainbow of Aussie colour just waiting to happen!! Keep watching! @PDP – Have no fear, there will be MANY MANY more shots of WA to come!! You might even get sick of them!!! @Saucy Kod – No crocs in the pools, and Pilchard just would not pose for a photo, so I was forced to take one of a random stranger … life is SO TOUGH!!! @Kath – They’re on their way!! Just keep checking my shop!! @Iris – Can’t believe you missed Lake Argyle! It’s not that far from Kununurra … oh well, next time!! Come on down anytime!! @SFlaGuy – Actually, I’ve got quite a few killer blue pix – keep watching for the calendar!!! @Filip – Thank you! It’s a little bit different from your ornate architecture, isn’t it?! @Joan Elizabeth – Haha, I wondered what you’d say about the mountains!! But I did think it’d be a teensy bit obvious to choose the Blue Mountains, wondrous though they are … besides, I didn’t have any really good pix! @River – Thank you, my friend! We once saw an emu wandering along Daly Head beach, and galahs roost in the cliffs! Awesome!! @Jane & Lance – Dreary weather seems at odds with the vibrant colours of OZ!! If you’ve had a moment of escapism, my work is done! @Are We There Yet – Yes, I like my BLUES tinged with a bit of RED! @Hootin Anni – The natural spring water feels even better than it looks – if you get there before the backpackers, that is! @Carole – Dream away, my friend! Bonzer is a great word too!! @diane b – The article is there now – I published my BLUES before the REDS went up!! @Rose – You come back anytime with comments like THIS, girlfriend!! @Beach Bum – No crocs down south (water too cold) but you’d probably be in serious danger from the surfies!!! @Jill – I was a recent convert to the BLUE!! But it’s best when it’s got red in it, right?!?! @Pieces of Sunshine – The more I look, the more I find! I’ve travelled a lot, but there’s still LOTS I haven’t seen! @mick – Thank you!! Looking is the key to finding … a rare RED profound moment!! @Annabel – So I’ve made you want to see more of OZ? Then my work is done! See you at Bitter Springs!! Great photos Red. I love how the blues vary across the land yet all are stunning. Of course, only in the amazing Kimberlys can the water be both blue and red! Stunning photos Red, the contrast are amazing, especially in the first and last pics. That thermal spring in the NT looks inviting… no crocs? Awww, those colors, amazing! Broome´s mangroves are the best. Are they? Can´t decide. And wow, Lake Argyle, how happened we missed it?! Oh, thanks for those sweet memories! In Mataranka we sat on the porch of the campground-“restaurant” at the Hot Springs, had vinegar chips (unknown here) when someone turned on Sweeet Home Alabama like real loud in the jukebox, pic: Forrest Gump. Ahhh, wanna escape the cold here and be there instead. And have a Hawaiian Pack from Chicken Treat, something we don´t have here, either. Cool blue indeed! Just what I needed today– a pleasant mini vacation looking at your photos! Thank you! Fantastic photos Red and I love your take on red and blue. Very funny, but so true. 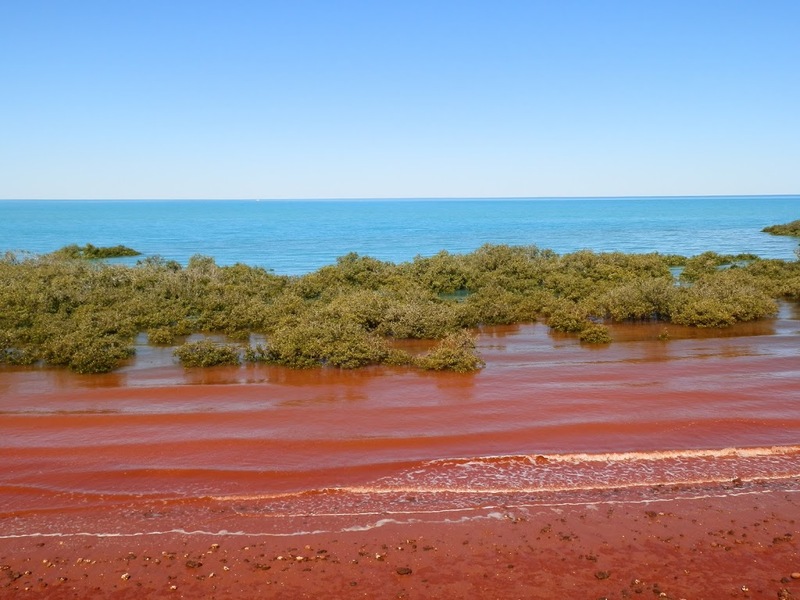 Red tide at Broome is amazeballs. some of those photos are ‘dreamy’ and I really wish I’d have thought of “colloquial contrariness”. That’s really bonzer Red! Lovely photos, but the last one just looks so wrong. Red water indeed. Gorgeous scenery!!! I especially liked the one with the water rippling from the natural spring. Love all your photos but the Red tide at Brooms with the blue is amazing. Good Job RED!! Your photos and stories make me want to see more of Australia than any travel brochure. The Bitter Springs pool is calling my name very loudly! Great article, it show how different water can be and it is not even moving. Great photos and I enjoyed your commentary on the scenery as well! Now I need to get out and have another look at the “blues” I see around my area. I love our blue’s and reds. A country of so many gorgeous colours and amazing sights. You have certainly been around much of our country. Ok…. the calendar is in the mail and arriving soon and now I want the Blue edition. Actually I want poster sized prints of these for the new house. I could then be surrounded in beauty counting of the days till I could visit in person. Great red blue shots Red. As an Aussie I love the red and blue of Australia. And I have seen them often in stark stunning contrast. Peron Peninsula at the tip of the Shark Bay is one. I haven’t seen any of your selection except the WA ones, but hope to see the rest some day. We had a flight over Lake Argyle – magnificent! Absolutely love the Blues n Reds–RED, Eh! Great Post – loved it, my friend. Two of my fav colours Red, love the combination, lots of lovely shots os WA, nice!! Super photos of blue Australia. I also like the larger size of your photos now. I couldn’t find your article on the link. Was there ever bluer blues than these? Your photographs are truly stunning and provided a most glorious escape from the drab and dreary greys of English weather which we have experienced of late. Australia does seem to be, in our eyes at least,a country of the most amazing extremes. You have captured the 5 star blues perfectly here! I love the clear water at Bitter Springs and I’m imagining myself living in a beach house above Daly Head and walking down those steps every morning to wander along the beach. Wow, gorgeous scenery and photos. The water looks beautiful. I would like to swim in the thermal pool. Thanks for the lovely tour, I wish I was there! Have a great day! ‘bakery dotted landscape” [snort]. Who cares about colours? Now that would be heaven for me! Just out of curiosity, would there be crocs or any other nasty critters that might eat me if I decided to sleep on that beach? oh and the thermal springs too!